Don’t look now but your values are showing. We all want to be what we are not. If you have brown eyes you want blue, if you have curly hair you straighten it. As a kid I had to wear “slim” jeans and so desperately wanted to wear “husky” it sounded so tough, and now skinny jeans are the rage. We want to be certain things and aspire to them but who we are shows through. I recently went Black Friday shopping for the first time in my life. Saying it was crazy doesn’t do it justice. I am not a fan of crowds, and don’t ever feel like I have to have anything bad enough to wait in line for it. I’m just not that cool. But this year a deal came up I couldn’t pass up it was well worth an hour or two in line. I was shocked by the confusion, misinformation, and overall craziness that transpired. There were no lines, no signs, no information and it wasn’t until last-minute someone handed out numbers. The cardboard container holding all the video games was destroyed and people were on their hands and knees looking for games. All of this could have been avoided with a little forethought. I have never seen so many shoppers in one place and every year it’s the same thing. You would think they would have put more thought into creating a system. 10:00 pm came people were screaming pushing and games where flying. I don’t think I will ever go to Wal-Mart for Black Friday again. What does Wal-mart value? – Cheap stuff sold to lots of people they make their money from bulk sales. No matter what values they put up in their break room they value bulk first customers second. It doesn’t matter what you say your values are it’s what you do that shows what your values are. Have you ever gone to see a movie because the first one was so good and you left wondering why you wasted your money. I have. The new Rizers CD was nothing like that in fact I may like the second album better than the first one. Before the first Rizers CD came out I thought that scripture songs were forced, dated and often times lame. 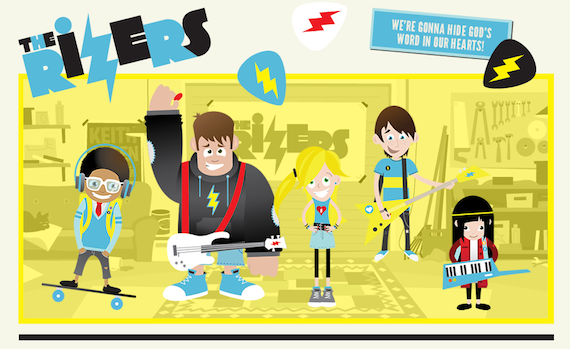 The first Rizers CD “Meet the Rizers” set the bar for scripture songs for kids in my opinion. I was curious to see if they would be able to match the quality of their first album they did that and some. I love how they take scripture and bring it to life in a way that it gets stuck in your head whether you like it or not. Every time I hear kids worship that is made on this level I think how blessed our kids are to grow up with resources like these. When I was a kid we had a singing Robot named Colby and Bullfrogs and Butterflys. You kids will love this CD I guarantee it. We do a dance party with our kids most nights before bed. The new Rizers CD has made it’s way right after Party in the USA and Dynamite. Track 1 John 14:27 (Do Not Be Afraid!) is our favorite. We also like Track 04 Philippians 4:13 (I Can Do Everything!). If you have kids or are looking for some fun Scripture based worship music for your kids church you need both of their albums. One last thing. I love the rizers because they believe in the local church and their mission statement is right on! Our mission is simple, we want to instill in kids a love for Jesus Christ and his Word through Scripture memory, praise and worship. We need more resources to help our kids love the bible. So go out support The Rizers download a disk today from Amazon, you will thank me later. *The Rizers provided me with a free copy of their CD to review. Happy Thanksgiving Everyone: Practice Thankfulness. Today is Thanksgiving. One of the best pieces of advice I have ever gotten was from Brother Jim. He told me that when I feel overwhelmed or feel like giving up I need to practice thankfulness. I am so grateful for all of my families. 1. My personal family I am spending the week with them such a blessing love my family to bits. 2. My church family – So blessed to be part of a church family that loves me and my family. I am blown away by the team God has allowed us to be a part of. 3. My blog/kidmin family – Appreciate each of you stopping by my blog adding your voice to the conversation. You all bless me beyond words. Happy Thanksgiving. Enjoy you families. Practice thankfulness. I spoke to nearly 800 preteens and leaders at Springhill Camp in Evart, Michigan over the weekend. Can you imagine being in a room with nearly 800 preteens? The energy level was through the roof! God did some amazing things and I was honored to be a part of what God was doing. Preteens are open and eager to learn. During the four messages over the weekend, I could sense that what I had to say sunk in. They were attentive to what God was saying though me. Just getting that many preteens to sit still and pay attention is commendable, much less having an impact. They were open to God and eager to learn about following Jesus. It was awesome! Preteens, 4th-6th graders, aren’t yet teenagers. So, the walls aren’t yet up. They’re open to having a relationship with Jesus and eager to learn what it means to follow Jesus in everyday life. They won’t quite soak up everything you have to say as absolute truth, but will take time to process a message with an open heart and mind. Asking questions is necessary for them to own a message and put it into practice. Preteens are eager to learn what it means to live out their faith. They want to hear God speak to them through reading the Bible and excited to engage with God through prayer. When given an opportunity to respond what God is doing, they do. I had a ton of comments from preteens throughout the weekend. I was told about 100 times that I look like Ian from Alvin and the Chipmunks. I’m blind without my contacts, which I usually wear, or my glasses. But this weekend, I wore my glasses. I was told over and over I look like Ian. Ha, gotta love preteens! On a positive note, I had one preteen approach me and introduced himself. He said I was the best pastor he’d ever experienced. Then a short awkward pause followed. He then offered me a piece of candy. Sort of his way of saying thanks. I think it was less about me and more about the impact God made in his life over the weekend. Us adults usually keep those kind of comments to ourselves. Preteens are outspoken. Not having much of a filter, they speak what’s on their minds. When it’s negative, don’t get offended. Most of the time, their intentions aren’t bad. When it’s random, enjoy a good laugh. When it’s positive, affirm them for pointing out something good. Learn something from the fact that preteens are outspoken. Sometimes we adults keep things bottled up inside that need to be said. 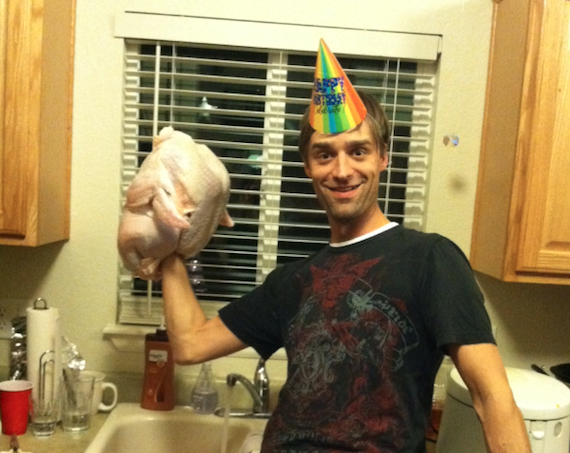 We’re celebrating Thanksgiving in a few weeks. In the spirit of gratitude, be thankful that you lead preteens. Appreciate their open, eager hearts and outspoken mouths. Nick Diliberto is the creator of preteenministry.net, which provides creative curriculum and resources for preteen ministry. He is also the preteen columnist for Children’s Ministry Magazine and Children’s/Family Pastor at Seven San Diego Church. Our church is in a series called Grow Up. We are walking through the book of 1 Corinthians talking about spiritual maturity. We did a few sermon bumper that I thought were hilarious. Our video guy Matt Daughtry is talented, leads a great creative team and is one of the nicest guys I know. Growing Up – The Office from redeemer.tv on Vimeo. Growing Up – The Office Part 2 from redeemer.tv on Vimeo.